Detailing his own ayahuasca experiences over hundreds of sessions, including a trip in 2009 when he underwent 17 ceremonies in 25 days, Kounen describes how ayahuasca transformed him. He tells of his meetings with Shipibo healers, including Kestenbetsa, who opened the doors of this world for him, and Panshin Beka, the shaman to whom Kounen became an apprentice. He details the many other plants and foods that are part of the ayahuasca healer's medicine cabinet, such as toé and tobacco, as well as their icaros, or healing songs. 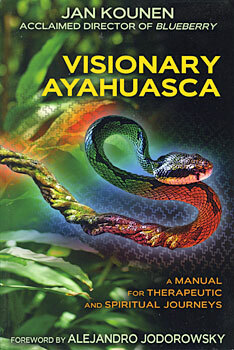 A veritable "what to expect" guide, this book should be your first step prior to committing to ayahuasca. "This is the first book that anyone thinking about taking ayahuasca, or taking it again, must own." Jan Kounen is a filmmaker who has created a number of films and documentaries, including 99 Francs, Coco Chanel & Igor Stravinsky, and the celebrated Blueberry. His interest in Shipibo culture and shamanism developed during his trips to Peru to shoot music videos, leading to his apprenticeship to an ayahuasca shaman. He lives in France.